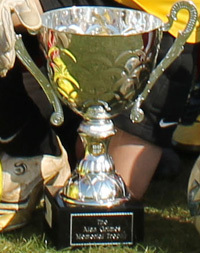 The Alan Grimes Memorial Trophy began in 1975-76 as an 11-a-side competition and entry was restricted to schools with under 35 boys in the top two years of the Primary school. Because of FA rule changes this became a 7-a-side competition in 1999-00. The Competition is played according to the FA Laws for Mini-Soccer (7v7). Entry is restricted to schools with 101 or more pupils in Key Stage 2. Only pupils in Years 5 and 6 are allowed to play.